Why was 2^127-1 an interesting problem for “Baby”? A vignette within the short video shows a clip of someone writing the expression 2127 - 1 on a chalk board. Why would an expression like this be a good test of an early stored-program computing device? It of course would not be the only test, and at some point perhaps computing pi would have also been tried, but why might this have been one important test? It's hard to know for sure with just that picture, but that's a Mersenne number and a prime one at that. When a mathematician writes a Mersenne number on a board they are not thinking about getting all the digits. By far the most interesting and likely question computationally speaking would have been "prove that the number is prime". That could be used as a test since that number was known via e.g. Lucas–Lehmer primality test that indeed it was prime (Mersenne.org says this one was found by Lucas himself, 1876). However, running a test program that is not supposed to find a result is not necessarily the most robust of tests, because there are many ways the program could fail and still not find anything. Still, it might be helpful if they were able to monitor the progress steps as it ran. That assumes the question was really used as a reliability test at all. I think it's just as likely that it was put on the board to show the newsreel crew "what kind of problems are of interest to mathematicians, which this machine would be able to resolve a lot faster than humans could". The scientists might have explained how Lucas needed X days/weeks/months to prove that the number is prime but the machine could prove it (e.g. by computing the Lucas-Lehmer test) in seconds/minutes. Take that and the rest of the reel to the editing room, and it can quickly morph into the narration we are presented with. The footage used in the clip is not just from the Manchester Baby, but also from the Manchester Mark 1 which became operational about a year after. As noted its first (usefull) programm was in fact a proof for mersene primes, a perfect fit for the chalkboard scene. Looks like the combined effort has revealed that this video features less than exact wording (equation vs. expression) and a mixture of pictures, not all belonging to the topic named. The first of three programs written for the machine found the highest proper divisor of 2^18 (262,144), a calculation that was known would take a long time to run—and so prove the computer's reliability—by testing every integer from 2^18 downwards, as division was implemented by repeated subtraction of the divisor. The program consisted of 17 instructions and ran for 52 minutes before reaching the correct answer of 131,072, after the Baby had performed 3.5 million operations (for an effective CPU speed of 1.1 kIPS). It's all about what to test. In this case it might be not only correct workings, but more about reliability over longer durations. Doing one operation right isn't a big deal and can be tested while building. Doing it a million times under program control is. Similarly, #3, where again #4 is a crucial restriction, as it is less of an issue for a small program to prove it's correctness as a transformation of the problem. A problem like finding all/the largest divisor fits well to all of these points and even offers secondary benefits like being repetitive but with changing data. 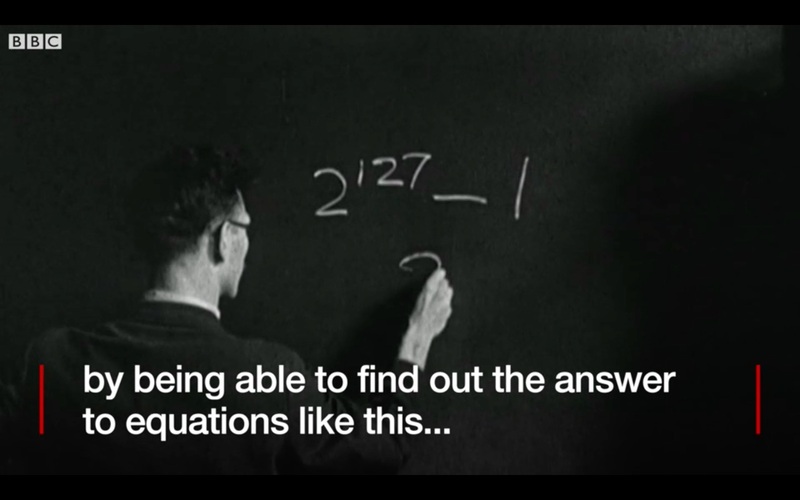 A vignette within the short video shows a clip of someone writing the expression 2^127 - 1 on a chalk board. Well, as usual with such an out-of-context picture, multiple explanations are possible. First 2^127-1 is not a problem but a number (the largest number that can be written using 127 bits). And we can only guess what it should mean. Then there is a question mark below, so maybe that is part of the notation? As in "What's the largest divisor for 2^127-1"? Then there's a separate section in the Wiki article naming the first three programs, with the third being one for long divisions (written by Turing), so maybe above describes exactly this program as in allowing to "dividing (anything up to) 2^127-1 by some number" (*1). This would, of course, mean that the pictures taken where not from first operation but at least 3-4 weeks later (*2) when Turing wrote that program (*3). Above clip being obviously edited and merged from original reels and pictures, this might be quite possible. Or it is, as so often when media report about something, a staged setup. Just a scientist writing something on a chalkboard to make it look good. After all, reporter and film crew may have had - as so often - no idea what it's about and were just looking to make it work on the screen. The text "...equations like this..." might be another hint, as it's obvious not an equation - journalists often use words they believe to be fitting but not really words that describe what's shown or happening. Remember how often some stupid header files are dumped on screen when there is some reporting about programming or anything computer related? Not a new invention. Make your pick, I would name the second one to be true - but I can't rule out the last one. *1 - 2^127-1 would be the largest number that can be packed into four 32-bit words while still leaving one bit for a sign or other markings (like NaN). Again a little hint on multi-word arithmetic as Turing obviously programmed. Of course, without more detailed information about how many words that program used (or maybe a variable number) for its 'BigNum' representation, it is just a little hint supporting this explanation. *3 - More support for this comes by the fact be that it is hard to imagine that any other, more complex problem (like proving a mersene prime) is described, as such would clearly go beyond the abilities of the Manchester Baby. It was only a demonrator with 32 words of memory, usable either as program or data storage. Already the (rather simple) first program used up 25 of them (17 instructions, 8 data). Further the machine offered only 3 ALU instructions (subtraction, negation and test for a negative number), so any higher function must be replaced by looping arround these. I can see no chance to implement something as complicated as a Lucas Lehmer Test. Not the answer you're looking for? Browse other questions tagged history hardware-testing testing or ask your own question. Why was the 6809 so expensive?